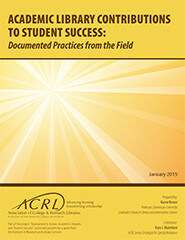 ACRL has released a new report “Academic Library Contributions to Student Success: Documented Practices from the Field” which synthesizes results from over 70 higher education institutions from across North America which recently completed team-based assessment projects. These projects, from the first year of Assessment in Action: Academic Libraries and Student Success (AiA), resulted in promising and effective approaches to demonstrating the library’s value to students’ academic success. Interested in participating in the next round of Assessment in Action? ACRL is seeking applications from all types of higher education institutions for 125 additional teams. Apply by March 4, 2015, to participate in the third year of the program, April 2015-June 2016. This entry was posted in Uncategorized and tagged Academic, ACRL, assessment, Educational assessment, higher education. Bookmark the permalink.